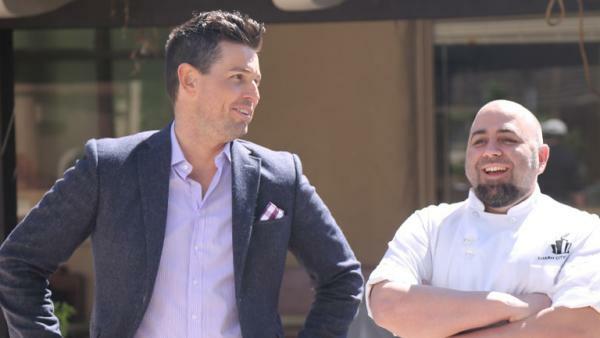 Host Ryan Scott sets up two extremely tricky challenges for three talented home chefs who are competing to create the very best grilled dessert. These home chefs are being pushed way outside their comfort zones as they face two grilling challenges. Who doesn't love desserts! But, can you make them on a grill? Three home chefs from across the country think they have what it takes to win the dessert challenge. They will compete in the beautiful outdoor kitchen at Sunset Magazine's Headquarters in Menlo Park, California. The winner will walk away with a $1,000 gift certificate from Cost Plus World Market. First, it's time to meet the competitors. Jason Amadori lives in Tucson, Arizona with his 6-year-old daughter. He owns Luke's Sandwiches and in his free time he writes children's books. He is an artist at heart and likes to apply that creativity toward food. Next up is Shayla White who is a married mother of two from Texarkana, Arkansas. She works in insurance but she really likes to cook. With no formal training, this self-taught chef is full of energy and ready to grill. And the third contestant is Laura Vreeland, a baker and business owner from Warwick, New York. This married mother of four owns Laura's Sweets Specialty but she has no professional cooking training. The contestants take their spots at their assigned cooking stations and Ryan Scott tells them the rules. In round one, they are only allowed to use the tabletop grill, they will have 15 minutes to put their spin on a dessert we all loved as kids and they can use any items from the pantry. Plus, they will have to use the mystery ingredient under the doom. The winner of this round gets five extra minutes of cooking time in round two. It might not sound like a lot but it can be the difference between winning and losing. Ryan gives these chefs the go ahead and reveals the secret ingredient they will have to use in the first round -- marshmallows. And, he challenges them to make the ultimate s'more. Ryan will judge the first dessert off of taste, originality and presentation. The contestants rush to create the grilled dessert in just 15 minutes! Jason wants to make a citrus flavored s'more while Shayla uses peanut butter and banana to give her dessert a creative and flavorful twist. And, Laura flavors her s'mores with nuts and caramel. Now it is time for Ryan's sweet tooth to find a winner. Jason made s'mores with grilled oranges, a prickly pear syrup and sea salt. Ryan didn't appreciate the color of the sauce on his dessert but he enjoyed the combination of the sweet and savory flavors. Shayla's s'more combined peanut butter, butterscotch, white chocolate and banana in a graham cracker sandwich. Ryan thought the presentation was lacking creativity but the flavors were unique and delicious. The last dessert Ryan had to taste was Laura's s'more -- which was made more delectable with caramel, white and dark chocolate chips, walnuts and pecan cookies. At first glance, Ryan thought her dessert resembled a s'more but after tasting it he suggested that she use a little more salt to give it more flavor. After a lot of consideration, it was Shayla's dessert that won Ryan over. She will get an extra five minutes of cooking time in the next round. Ryan brought in some of his friends to judge the next round -- Ace of Cake's star Duff Goldman and Sunset Magazine's Margo True. They are looking for originality, presentation and, of course, taste! The next challenge was for the contestants to bake a cake on the grill! Ryan gave them a basic cake recipe and a Weber gas grill to use. The cake must be six inches tall and they have 75 minutes to complete this round. "I tell you what... baking a cake on a grill is not an easy task. It is not easy for home chef or a professional. It is just something that you don't really want to do," said Duff Goldman, professional chef. Since Shayla won the first round, she gets an extra five minutes. After she gets started, the other contestants followed right behind her. Everyone is stressing over how they are going to bake the cake on a grill. It is extremely important that their grills don't get too hot and the cakes bake over indirect heat so they don't burn. With time running out, the contestants struggle with their cakes. Since Laura forgot to put milk in her batter she pulls it off the grill to add it. The judges aren't sure if this is a good idea. But Laura isn't the only one with troubles. Jason's camping cake isn't baking. He opened up his tinfoil to find it still gooey. With only 30 minutes left in the competition, he makes a backup cake just in case. But is there time to pull it off? Shayla burned her cake so she cuts the blackened edges off her cake and hopes it doesn't ruin the flavor. Jason also burned his cake so he layers cake slices on a plate and gets the ruler out to be sure it meets the six-inch requirement. Laura's cake is the only one that didn't burn but she is struggling with the sauce and homemade ice cream. Time is up! The contestants stop working and wait for the judges to weigh in. Laura made a Bananas Foster Up Cake with homemade vanilla ice cream. The cake turned out very tender and moist but the bananas were ripe enough. Shalya made a Fruit Waterfall Pound Cake with umpa lumpa sauce and homemade whipped cream. The originality and presentation of the cake won the judges over. The flavor of the cake was perfect but the sauce was too pungent for the judges. Lastly, Jason made a Camping Cake with raspberry whipped cream and grilled pineapple. The judges were impressed that he was able to switch gears so many times during the competition and they liked the deconstructed presentation of his cake. After the judges deliberated the cakes, they choose the winner -- Laura. She won a $1,000 gift card to Cost Plus World Market. "I am the queen of the grill!" said Laura. For more information on Cost Plus World Market visit worldmarket.com. The contestants cooked on Weber Grills. The perfect cocktail for any summer occasion! Dessert never fails to foster joy, especially when it's made on a grill! Feeling manly? After fixing your car, and watching the big game, why not reward yourself with a man cake? Delicious s'mores made more delectable with caramel, white and dark chocolate chips, walnuts and pecan sandies cookies. Gather around the desert campfire and share this unique fruit-infused take on a classic dessert! A campfire dessert with so much s'more! Peanut butter, bananas and butterscotch transform this traditional dessert into a unique delicacy. Three talented home chefs with infectious personalities vie to create the most delicious and creative desserts on a grill.